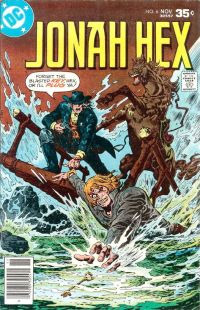 Matching Dragoons: Jonah Hex #6 "The Lawman"
I haven't read this one, but from your description, it does sound hilarious...in that "sometimes something is so bad that it's good" sort of way. George DOES sound like he has the mental capacity of a potato. Sorry, that your scanner is still on the fritz. I have some original comic book art that I want to sell. One of them is from a Jonah Hex comic. It has the full page as well as the comic book it appears in. I am in completely unfamiliar territory here. Can you tell me the best place/way to get the fairest price? Any help is appreciated.